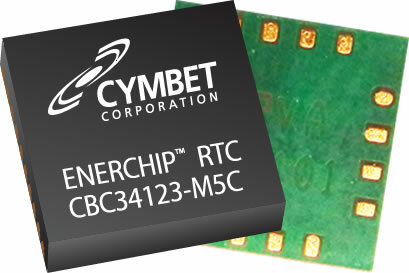 The Cymbet EnerChip RTC family of devices are the first single chip solutions to combine an ultra-low power Real Time Clock a Solid State Rechargeable Battery and an integrated power management integrated circuit (PMIC) into a small surface mount reflow-solderable plastic package. The EnerChip RTC is approximately 100x smaller than legacy combination devices such as the ST Micro Snaphat®. The EnerChip RTC is shipped on tape and reel, uses SMT assembly and is reflow tolerant. EnerChip RTC lasts the life of the system so you never have to change a backup battery. EnerChip RTC devices provide powerful single chip drop-in capabilities in the world’s smallest footprint. It is easy to get started using EnerChip RTC devices. Each EnerChip RTC device has an Eval-12 kit that consists of a USB stick with a tab board for each EnerChip RTC and a PC-based Graphical User Interface. All CBC-EVAL-12 Evaluation Kits aere available globally at all Cymbet’s Distributors. Cymbet EnerChip RTC devices last the life of the product. All members of the EnerChip RTC family are reflow tolerant and are available in Tape and Reel for use with high-speed SMT pick & place assembly processes. EnerChip RTCs offer a fast recharge time (15 minutes to 80% charge), and are capable of greater than 5000 charge/discharge cycles. EnerChips do not suffer from the self-discharge limitations associated with super capacitors or shelf life limitations common to chemical batteries. EnerChip RTC devices are also complient with RoHS, REACH and UN Air Transportation Safety Regulations. EnerChip RTC device end-of-life WEEE disposal procesdures are the same as the other integrated circuit devices on a electronics assembly. To facilitate easy evaluation of the EnerChip rechargeable battery products, Cymbet’s Application Engineering Team can provide everything a designer needs to fully evaluate the performance and operation of the EnerChip energy storage devices.